Big Switch Networks (BSN) launches Version 4.0 of Big Cloud Fabric for hardware-centric SDN data centre fabric. 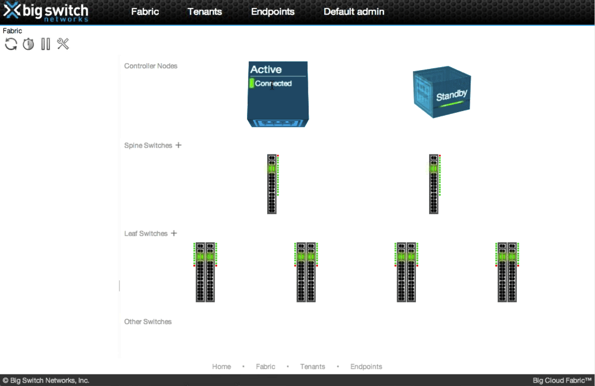 The Data Centre Fabric solution clearly shows the maturity gained from 5 years of shipping products while adding innovation in switch hardware through Switch Light operating system. At the same time, they have completed the transition from platform to product. A product that really has what you need in a hardware-centric SDN platform and addresses nearly all of the issues the competitors have not addressed. And it is shipping now. Switch Light is a network operating system for commodity Ethernet switches that is focussed on delivering the best possible flow management using enhanced OpenFlow constructs. The demands that OpenFlow places on network silicon is high but BSN has developed a combination between the device operating system and the controller that delivers a hardware SDN. Like Cisco’s ACI, Big Cloud Fabric delivers a hardware-centric SDN by tight integration with silicon, software and controllers. Unlike Cisco ACI, the price for Big Cloud Fabric is vastly less through the use of commodity switches and proves that custom silicon is not an absolute requirement for hardware SDN based on OpenFlow. 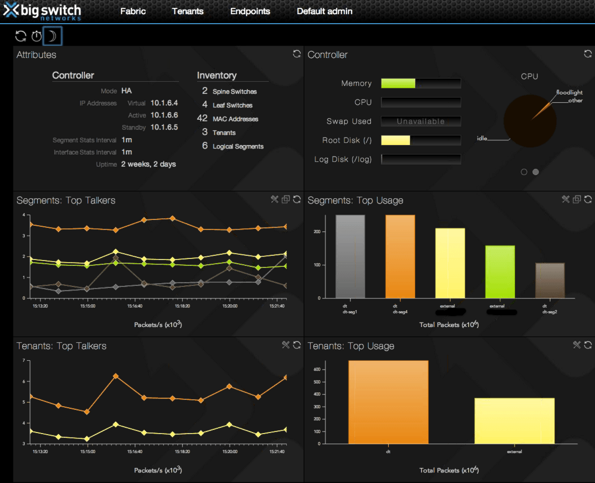 Switch Light will be available as a KVM virtual switch agent in the near future. OpenStack integration is available now while limited integration with VMware ESX will be possible. The use of flow tables in the physical networks means that VLAN, IP Subnets, L2 Switching, L3 routing and filtering are all part of solution. For those people who don’t believe in software switching or routing, Big Cloud Fabric does these functions in the flow table of the switch hardware for physical hosts while hosts with virtual Switch Light will use the local agent as needed. This applies to the virtual and physical switches. Like other SDN vendors, there is limited access to the ESX kernel so options on VMware are restricted in various ways but KVM support is on the roadmap. Multichannel LAG Big Switch Cloud, Switch Light and switch silicon co-operate to implement LAG/MLAG for robust reliability between switches. Here is a screenshot of the standard view for operations. This shows an ECMP Spine and the controllers. SDN controllers will replace most of the function that are in the SNMP Manager that you use today. Here is the status page from the Big Controller showing the current Top Talkers and various useful information. Note that this type of information is simply not possible with existing tools today. 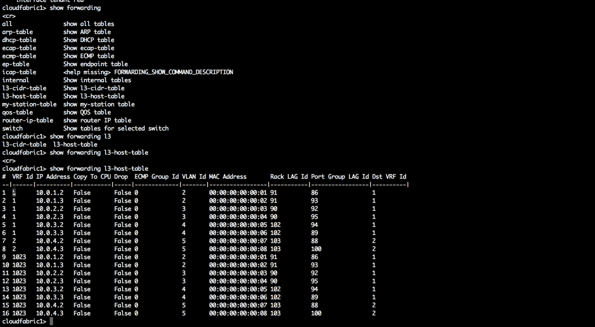 The next screenshot is taken form the controller CLI and shows a list of every IP address in the network with its MAC address and which port it is currently connected to. 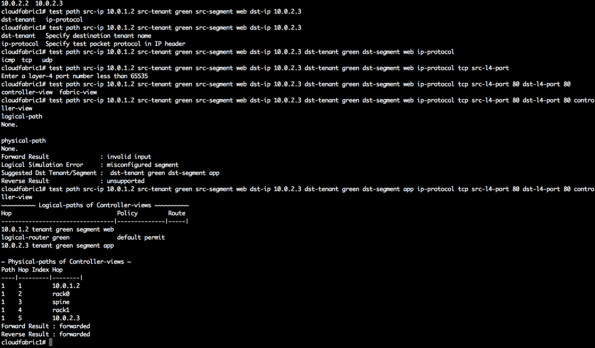 This screenshot show the path utility in the controller CLI and uses the flow database on the controller to determine the packet walk through the network. This next screenshot is a bit more complicated. 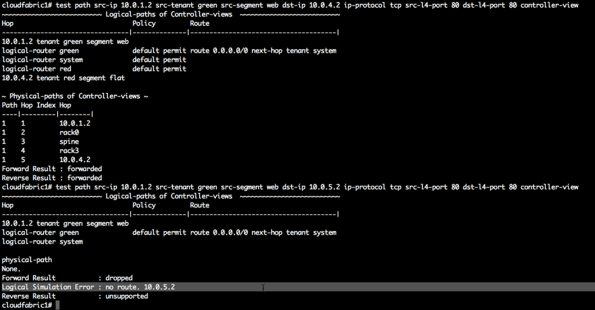 This path test shows that the exit from the tenant ‘green’ network hasn’t been configured properly and there is some issue with the path that needs to be resolved. 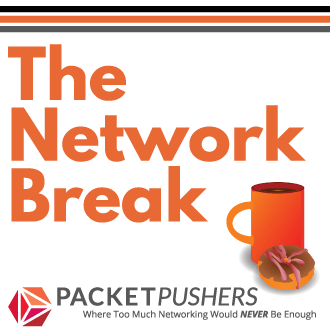 One interesting aspects of working with networking startups is how profitable they are. Today, networking prices are high and profit margins are very generous e.g. Cisco maintains 80% gross profit on the sales of data centre switches and routers. Startups can price solutions at cheaper prices and generate good revenue to invest in new products and sustain their business. Customers are finding the startups and often understand what they want to buy which means that cost of sales is low. Until there is a significant and shift in profit margins at the big player like Cisco & juniper, network startups are viable business for some years to come. One of the technical features that is hardest to solve is ARP. Any device with an IP address in the network must be able to broadcast IP to MAC address resolution request. For software based SDN vendors, ARP is handled in the virtual switch or using IP Multicast in the physical network. Switch Light implements an ARP handler in the physical switch. While I am a believer in software overlays, there are features of hardware networks that will always be superior. For Big Cloud Fabric, one such feature is that a physical path failure is managed by monitoring the physical interface using basic MLAG function that exist in the silicon. Hitless upgrades are implemented today in the switch hardware and controller. This means that the controller and switch code can be updated dynamically. It does this by working out the redundant topology in the network and then upgrading the “half” of the network switches that is not active and the backup controller. For a short period of time, 50% of switches and controller are being upgraded then control is transferred to the standby. Switchover the upgraded network and deactivate the ‘old’ part. Lots of people get bent out of shape about elephant flows in the network. The controller can detect when this happens and a future version is expected to be able to regenerate the load balancing seed so that megaflows can be redistributed. BSN has automated the initial configuration of the switches. At install time, the switches will DHCP from the Big Controller and use ONIE to boot the operating system on the switch, the only configuration is the MAC address of the switch. Once connected to the controller the network is effectively self configuring. 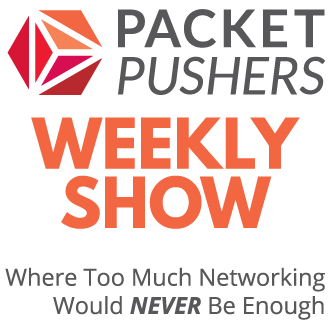 This feature is becoming common among vendors and especially in SDN platforms. There are several advantages to Big Cloud Fabric. The use of commodity hardware makes for low-cost of entry for a pilot project. low-cost hardware means that switches are disposable at shorter intervals to upgrade to new silicon and support new features (flow table size, 40GbE, flow functions, etc). Moves away from the box mentality to a solution function. Multi-tenant security functions are very advanced and are more focussed on applications security than simple “port security” or “server groups” as in competitive products. Well suited to network-centric customers who are still focussed on hardware networks and physical endpoints. A typical enterprise could buy and use this product today. I had a demo of the near-final product last week and I’m seriously impressed with the solution. I worked though my SDN checklist of questions, there was very few things that didn’t have answers. Big Switch has taken SDN, OpenFlow and controllers and made a compelling product. I’m looking forward to getting my hands on an evaluation version that runs entirely in emulation since Switch Light is Linux can run in a KVM instance. This means that you develop orchestration and automation code against a reference platform that runs in an emulated system. The solution manages physical endpoints today and will add virtual endpoints in the near future. For many customers this solution will be very appealing. The low entry cost of hardware, mature product base that has been shipping for three years and features that address the integration with the autonomous network mean that customer evaluating SDN should be adding Big Switch Networks at the top of their list. Yet another SDN solution is here and ready today. No need to wait, get a pilot started. Can’t create a write-up of a vendor without taking pot shots at Cisco. Common complaint but with 70% of market share they get 70% of criticism. Think big and stop whining. 2. Customer feedback is that Cisco ACI doesn’t perform well in test labs. Some bugs, some limits and overall problems suggest that the software isn’t ready. Works for some, of course, but doesn’t work for everyone. 4. The AVS switch component is still under heavy development. 5. the complexity of ACI is needed for Cisco’s big ambition for the product to cover WAN, Security and Campus in addition to DC. At the same time the complexity puts customers off. Cisco has a lot going for it. It’s great partner, it is dominant in the market, it makes outsized profits, and can compete hard to win customers. But with Cisco ACI I’m not so sure that we have the right solution yet. There is a lot of hard work ahead to make it customer ready. Cisco is a big company and get 70% criticism when it own 70% of market share. Hi Greg, the last sentence of the L3 Exit Points paragraph seems to be missing/cut off. Otherwise very informative and interesting read. I was trying to compare this with an overlay solution. Some of the problems that overlays solves are vlan scale, vmotion related issues, overlapping ip space etc. how will the big cloud fabric address these issues?